Gossip's Wine was launched in 2003 and is now one of Australia's fastest growing brands of wine. Introduce your friends to a new trend with this delicious wine hamper. 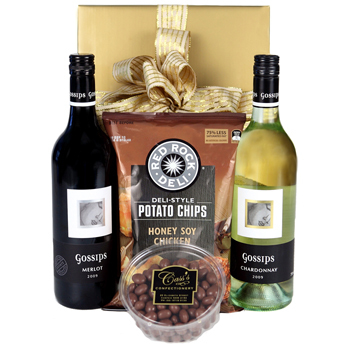 Your recipient will receive a robust bottle of Gossip's Warburn Estate Merlot (750 ml), along with a bottle of crisp Gossip's Warburn Estate Chardonnay (750 ml), with a bag of Red Rock Deli Sour Cream & Sweet Chilli Chips (45 g), and sweet Milk Chocolate Coated Sultanas (220 g). Impress your friends, spoil your partner, or celebrate a Birthday with A Glass Of Gossip.